The beta extension brings up a menu containing "1password beta" which when clicked takes you to 1password.com, "1password" which does nothing and then the chrome extension hiding an removal options. I enabled developer mode and got a log, it seems to be attempting to connect to the app using the native messaging as it should, and failing. global.min.js:205 1Password version 4.6.4.3 loaded @ Sat Mar 25 2017 15:07:33 GMT+1100 (Local Daylight Time) global.min.js:72 Finished loading auth configuration. Processing callbacks. global.min.js:226 [CHROME:NM] Port <[object Object]> disconnected: Native host has exited. b @ global.min.js:226 2global.min.js:79 [AGENT] Connection [object NativeMessagingConnection] disconnected. E.connectionDidDisconnect.Fb @ global.min.js:79 global.min.js:72 Finished loading auth configuration. Processing callbacks. global.min.js:226 [CHROME:NM] Port <[object Object]> disconnected: Native host has exited. b @ global.min.js:226 2global.min.js:79 [AGENT] Connection [object NativeMessagingConnection] disconnected. E.connectionDidDisconnect.Fb @ global.min.js:79 global.min.js:72 Finished loading auth configuration. Processing callbacks. global.min.js:226 [CHROME:NM] Port <[object Object]> disconnected: Native host has exited. b @ global.min.js:226 EventImpl.dispatchToListener @ extensions::event_bindings:388 publicClassPrototype. (anonymous function) @ extensions::utils:149 EventImpl.dispatch_ @ extensions::event_bindings:372 EventImpl.dispatch @ extensions::event_bindings:394 publicClassPrototype. (anonymous function) @ extensions::utils:149 dispatchOnDisconnect @ extensions::messaging:323 global.min.js:79 [AGENT] Connection [object NativeMessagingConnection] disconnected. E.connectionDidDisconnect.Fb @ global.min.js:79 (anonymous) @ global.min.js:222 disconnect @ global.min.js:226 (anonymous) @ global.min.js:224 pause.pause @ global.min.js:224 (anonymous) @ global.min.js:73 b @ global.min.js:226 EventImpl.dispatchToListener @ extensions::event_bindings:388 publicClassPrototype. (anonymous function) @ extensions::utils:149 EventImpl.dispatch_ @ extensions::event_bindings:372 EventImpl.dispatch @ extensions::event_bindings:394 publicClassPrototype. (anonymous function) @ extensions::utils:149 dispatchOnDisconnect @ extensions::messaging:323 global.min.js:79 [AGENT] Connection [object NativeMessagingConnection] disconnected. E.connectionDidDisconnect.Fb @ global.min.js:79 (anonymous) @ global.min.js:222 (anonymous) @ global.min.js:225 EventImpl.dispatchToListener @ extensions::event_bindings:388 publicClassPrototype. (anonymous function) @ extensions::utils:149 EventImpl.dispatch_ @ extensions::event_bindings:372 EventImpl.dispatch @ extensions::event_bindings:394 publicClassPrototype. (anonymous function) @ extensions::utils:149 dispatchOnDisconnect @ extensions::messaging:323 global.min.js:72 Finished loading auth configuration. Processing callbacks. global.min.js:226 [CHROME:NM] Port <[object Object]> disconnected: Native host has exited. b @ global.min.js:226 EventImpl.dispatchToListener @ extensions::event_bindings:388 publicClassPrototype. (anonymous function) @ extensions::utils:149 EventImpl.dispatch_ @ extensions::event_bindings:372 EventImpl.dispatch @ extensions::event_bindings:394 publicClassPrototype. (anonymous function) @ extensions::utils:149 dispatchOnDisconnect @ extensions::messaging:323 global.min.js:79 [AGENT] Connection [object NativeMessagingConnection] disconnected. E.connectionDidDisconnect.Fb @ global.min.js:79 (anonymous) @ global.min.js:222 disconnect @ global.min.js:226 (anonymous) @ global.min.js:224 pause.pause @ global.min.js:224 (anonymous) @ global.min.js:73 b @ global.min.js:226 EventImpl.dispatchToListener @ extensions::event_bindings:388 publicClassPrototype. (anonymous function) @ extensions::utils:149 EventImpl.dispatch_ @ extensions::event_bindings:372 EventImpl.dispatch @ extensions::event_bindings:394 publicClassPrototype. (anonymous function) @ extensions::utils:149 dispatchOnDisconnect @ extensions::messaging:323 global.min.js:79 [AGENT] Connection [object NativeMessagingConnection] disconnected. E.connectionDidDisconnect.Fb @ global.min.js:79 (anonymous) @ global.min.js:222 (anonymous) @ global.min.js:225 EventImpl.dispatchToListener @ extensions::event_bindings:388 publicClassPrototype. (anonymous function) @ extensions::utils:149 EventImpl.dispatch_ @ extensions::event_bindings:372 EventImpl.dispatch @ extensions::event_bindings:394 publicClassPrototype. (anonymous function) @ extensions::utils:149 dispatchOnDisconnect @ extensions::messaging:323 global.min.js:72 Finished loading auth configuration. Processing callbacks. global.min.js:226 [CHROME:NM] Port <[object Object]> disconnected: Native host has exited. b @ global.min.js:226 EventImpl.dispatchToListener @ extensions::event_bindings:388 publicClassPrototype. (anonymous function) @ extensions::utils:149 EventImpl.dispatch_ @ extensions::event_bindings:372 EventImpl.dispatch @ extensions::event_bindings:394 publicClassPrototype. (anonymous function) @ extensions::utils:149 dispatchOnDisconnect @ extensions::messaging:323 global.min.js:79 [AGENT] Connection [object NativeMessagingConnection] disconnected. E.connectionDidDisconnect.Fb @ global.min.js:79 (anonymous) @ global.min.js:222 disconnect @ global.min.js:226 (anonymous) @ global.min.js:224 pause.pause @ global.min.js:224 (anonymous) @ global.min.js:73 b @ global.min.js:226 EventImpl.dispatchToListener @ extensions::event_bindings:388 publicClassPrototype. (anonymous function) @ extensions::utils:149 EventImpl.dispatch_ @ extensions::event_bindings:372 EventImpl.dispatch @ extensions::event_bindings:394 publicClassPrototype. (anonymous function) @ extensions::utils:149 dispatchOnDisconnect @ extensions::messaging:323 global.min.js:79 [AGENT] Connection [object NativeMessagingConnection] disconnected. E.connectionDidDisconnect.Fb @ global.min.js:79 (anonymous) @ global.min.js:222 (anonymous) @ global.min.js:225 EventImpl.dispatchToListener @ extensions::event_bindings:388 publicClassPrototype. (anonymous function) @ extensions::utils:149 EventImpl.dispatch_ @ extensions::event_bindings:372 EventImpl.dispatch @ extensions::event_bindings:394 publicClassPrototype. (anonymous function) @ extensions::utils:149 dispatchOnDisconnect @ extensions::messaging:323 global.min.js:72 Finished loading auth configuration. Processing callbacks. global.min.js:226 [CHROME:NM] Port <[object Object]> disconnected: Native host has exited. b @ global.min.js:226 EventImpl.dispatchToListener @ extensions::event_bindings:388 publicClassPrototype. (anonymous function) @ extensions::utils:149 EventImpl.dispatch_ @ extensions::event_bindings:372 EventImpl.dispatch @ extensions::event_bindings:394 publicClassPrototype. (anonymous function) @ extensions::utils:149 dispatchOnDisconnect @ extensions::messaging:323 global.min.js:79 [AGENT] Connection [object NativeMessagingConnection] disconnected. E.connectionDidDisconnect.Fb @ global.min.js:79 (anonymous) @ global.min.js:222 disconnect @ global.min.js:226 (anonymous) @ global.min.js:224 pause.pause @ global.min.js:224 (anonymous) @ global.min.js:73 b @ global.min.js:226 EventImpl.dispatchToListener @ extensions::event_bindings:388 publicClassPrototype. (anonymous function) @ extensions::utils:149 EventImpl.dispatch_ @ extensions::event_bindings:372 EventImpl.dispatch @ extensions::event_bindings:394 publicClassPrototype. (anonymous function) @ extensions::utils:149 dispatchOnDisconnect @ extensions::messaging:323 global.min.js:79 [AGENT] Connection [object NativeMessagingConnection] disconnected. @ibrokemypie thanks for letting us know, are you using 1Password app 6.5.396 which is available on beta channel now? If yes, please make sure you have Gear > Options > Advanced > Enable Native Messaging for Chrome turned on. Once it's checked, clicking on 1Password icon in browser should start 1Password app and connect really quickly. 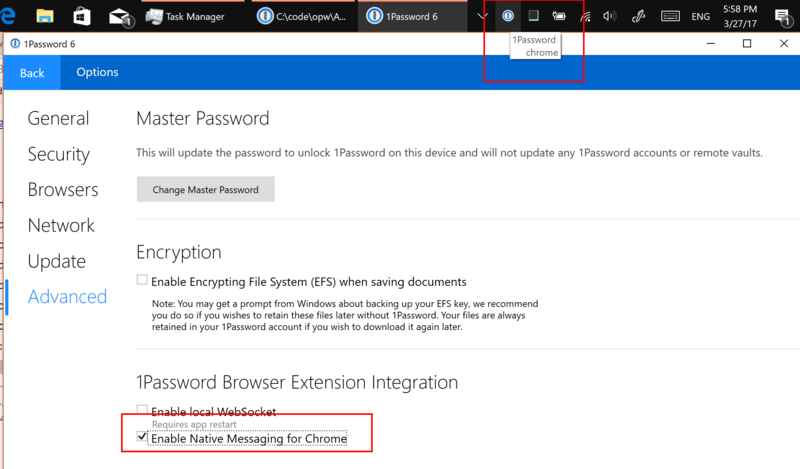 You can confirm connection by looking at 1Password notification icon tooltip in taskbar, it lists all connected browsers (Chrome in my screenshot).